I started writing this post almost two weeks ago. But it’s been lingering in my heart for a while. I kept this post in draft with just a few words, more like musings on a napkin instead of an actual outline. Part of me wanted to get it done and out. Part of me wanted to procrastinate and delay. If you know me, you’ll likely know why. But I’ve tried, as she said, to “lean into” me. After 11 years leading iThemes, the WordPress software company I started in 2008 in my home and which was acquired in January 2018, I officially turned in my notice earlier this month and will be departing Jan. 30, 2019. One of the first questions I know I’ll get, particularly from our amazing customer community, is:“What’s next for iThemes?” I wrote a post on the iThemes blog to help answer that from my perspective and how the future is good and bright for the team, customers and products. It’s a bittersweet moment for me, professionally and personally, and my family. I’ve had, essentially, one job (Founder/CEO then General Manager) for 11 years and it’s been the most incredible roller coaster ride I couldn’t have imagined. I only threw up a dozen times, but I’d ride it again. Personally, I’ve met and worked with some of the most gifted, passionate, caring, loving, committed, quality people in my life through iThemes, whom I luckily call friends. Even as I type this, I’m trying to postpone my sadness about not getting to talk to, see them and work with them every day as I have for so long. That is and will be the hardest part about leaving. These are men and women who I’ve spent a large part of my life with. 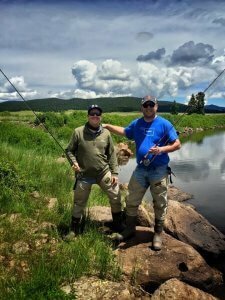 We’ve traveled together (like our flying fishing trip in the photo). We’ve opened our home to them like family (and our hangouts were the few times I stayed up past 2 a.m.). Most of our Oklahoma City office team were at the hospital when my children were born and held them before much of my family. I’ve seen so many of our team bloom and blossom in front of my eyes to become true rockstars but they always played as a band. They’ve made me better and I’ve worked to help them reach their highest potential. 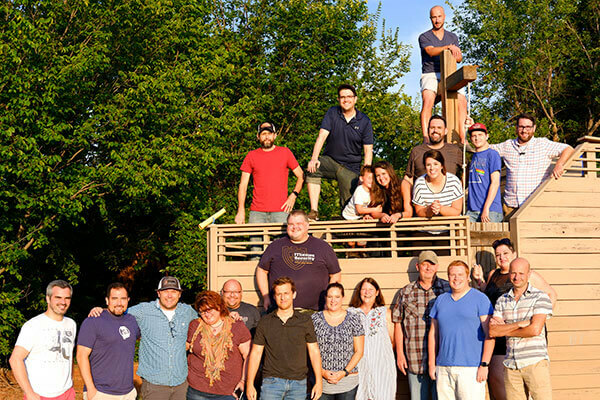 I couldn’t have done anything close (and I get too much credit) for the accomplishments of iThemes without this team. In business and life, it’s people who make the difference. Our people were the real true and lasting reward and I hope to continue being a part of their personal lives. Even though I’m only saying goodbye to my role at iThemes, I’ll savor and be forever thankful for these friendships and the time and love they have given me. And just ot be a part of their lives. At the same time, I’m also very, very excited for them, particularly for Matt Danner as he captains the ship, and I will be cheering for the team from the sidelines. I’m confident we’ve worked to put the team and iThemes in the best place and position to continue to do well … the sky’s the limit for them and I can’t wait to see what they do next. Additionally, my first lady, Lindsey, will be continuing her good work in WordPress at Liquid Web as Partner Manager too. So the team still has one Miller around! Professionally, I never thought I’d be in any “job” for 11 years. But as I reflect back, I’m immensely proud, honored and thankful of the body of work I can put a label on and call iThemes. I don’t know if that’s fully sunk in yet though. In a couple of days, I’ll leave this gig forever. And when the last day comes and the door shuts behind me, I have peace knowing I made an impact in other people’s lives. I’m sure I’ll ugly cry as I wave goodbye. As I hope you’ve come to expect from me … I am going to lay it all out. And to be honest, I’m 80% thrilled and 20% scared to start my next chapter …. that percentage changes day to day. I have a few things figured out … and much more not figured out. Those who say they have it all figured out are likely just as clueless and as lost as I’ve felt. But the one thing I do know is that on Jan. 31, 2019, I’m going solo again. To start, I’m incredibly excited to offer business coaching and consulting services. Looking back it’s something I’ve done rather informally over the years as I’ve helped others but also what’s given me great fulfillment and something that comes naturally to me. I wanted to formalize and refine the skills I’ve used over the last decade building and growing a team at iThemes and helping others think about and achieve their goals. So back in August, I started an Executive Coaching program at the University of Texas Dallas under the renowned Jindel School of Management. Through coaching, I want to support entrepreneurs, leaders and their teams go far together. That much I know. Through consulting, I want to offer my expertise as an entrepreneur, leader, marketer, product developer whether it’s helping with key initiatives or projects from marketing, new product development, strategy, recruiting, hiring and training. No matter how it eventually all looks professionally though … I want to apply my experiences and expertise and my strengths to “Make People’s Lives Awesome” again. And in the coming weeks and months I’ll be sharing more about that, but in the meantime, if you want to work with me, let’s talk. This is simply my first step. Like a lot of my life, I don’t have a detailed map, with exact coordinates and turns. What comes next is a bit of a mystery to me. And that excites me. I never imagined the wild ride I have had for the last 11 years or the path I would walk on … but I love it. And it was all mostly surprise. And it led me here. As I realized this adventure was over, building inside of me has been an overwhelming desire to go bigger, better, bolder. Not to take anything away from what has happened … I simply know I just went way higher than this kid from Lone Grove, Oklahoma, ever thought he could go. I got to punch all my dream tickets and then some. I realize I have more to give and offer and to do. I don’t want to leave any of it on the table. As I’ve reached mid-life, and struggled with it, deeply, I’ve been renewed by a sense of meaning and purpose. And I want to make the most out of what time and talent I have. To squeeze out of this life, this place, this opportunity all I can out of it. And that means making impact on people’s lives with my own, starting with my family. This time, this move, is all about being open to what possibilities are out there …. again. But now I stand from a different perspective. I’ve done things. I’ve been stretched and pushed and tested. I see differently now. I want to dream wildly. I want to explore with child-like curiosity. And I want to see what doors will open. All for impact and purpose. That simple formula got me here and I know it will lead to the next adventure. As I told my former partner last week, I’ve had one focus professionally for over a decade …. and now … I’m a free agent again. And I want to repeat that simple formula. It’s an opportunity for Reinvention and Recalibration, professionally and personally, that I’m looking forward to. One more thing I know but not in extreme detail is …. I want to do impactful work. The first is Mental Health. If you follow anything I do, you know this is a recurring theme for me. 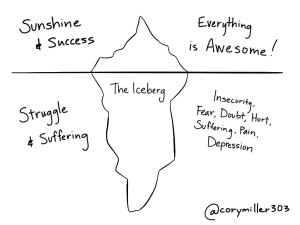 But it has become a core mission and purpose in my life since I opened up at WordCamp Denver in 2015 about divorce and depression and subsequently the Iceberg of Life. Every time I open up and share my struggles and story with others, I get this incredible reverb of others being able to take steps to healing and health. I want to explore how I can do more both personally and professionally in that arena. I can’t shake it. I don’t want to shake it. I’m moved and driven by it. I see so much hidden hurt in the world …. those suffering in solitude. And then changes and disruptions looming off the horizon that’ll affect all of us. And I’m not sure we’re ready for it. I’m particularly interested and curious about the place of work and the opportunities it holds to improve our mental health, not further damage it. Again, don’t know how it looks yet … but I’m driven to continue to push in and see what I can offer. The second is a combo of Entrepreneurship and Leadership. I love starting new projects (just a one-off project or 15, or a company, or an org) and leading and working with great people to do things bigger than we could apart. If I can combine the first theme with the second, that’s the ultimate win-win. But for now, I’m holding these in my palm, without squeezing them too tightly, and just seeing where they take me. So if you have a possibility or opportunity mashup of those you want to discuss, let’s talk. As I’ve been preparing for this next chapter, I’ve tried to reflect of some of the core things I do naturally … and that also got me here. I want to get back to my roots that started this whole thing and start publishing content regularly and consistently again. But in the next chapter I’m hoping to broaden and expand my skills into podcasting (which I’m already doing with Lindsey at This Ridiculous Life) and video. I want to learn and grow and teach and share. I want to publish. Put myself out there. And see what happens. My story and I think life and success and impact is all about relationships with great people. Every “success” I’ve had or amazing journey I’ve been on has been because of great relationships with incredible people. I want to continue to build my existing relationships and be open to finding even more. This is a fairly recent return and renewed focus for me. I can create. I’ve done it and for this first step, I’ll be doing it again. But I’m much better and more satisfied and impactful when I collaborate with others. And in the next chapter, I’m looking to collaborate more with good people, especially on the first (publishing) and with the second (people). I’ve already started discussions with a few key people. And hope to share those mashups and collaborations very soon. Stay tuned, or get in touch. So many times I’ve tried to plan it all out exactly and yes, perfectly. But I’ve found that simply sticking to my values and who I am and putting myself out there, chasing purpose and passion, and always, always, always connecting with good people …. the next chapter will be so much better than I can imagine! So this is me … stepping into the arena. You can listen in below or check out This Ridiculous Life website or on iTunes. Congratulations on making the leap to the next thing. You took iThemes to a great place and I’m sure you’ll have a blast on your own pursuing your new coaching (and related) ventures. Cory, what a great read! You’ve already accomplished so much and I know your next path(s) will be successful. Just starting a business is so frightening, but you had the guts to do it, be successful at it, and sell it. Very few people accomplish that. I wish we had the chance to collaborate more during your time at LW, but there’s always the future. 🙂 Thanks for the book recommendations by the way, I’ve already started my reading and I’ll come back to you for some more. I’d love to catch up and talk soon! Thank you for the encouragement! Congrats on your next chapter, Cory. You are inspiration to me. Thank you for modeling much of what I value in your work and life. You raise the bar, my friend. Here’s to your next chapter! As far as I’m concerned your best skill is people. You’re really good building & maintaining relationships. Don’t disappear! Good luck on your next venture. I don’t plan to but thank you for that encouragement! This isn’t goodbye to WordPress or the community even if I’m not working in it full-time. Congratulations my friend – a true inspiration. and good luck with your next project! Cory! I love me people who continuously push to find and explore new things and experiences. Thank you for all you’ve done for the WordPress community as a whole and I’m excited to see what you accomplish next. Cheers! Congratulations and many blessings to you as you begin this next chapter. So excited for you! I can definitely relate with being 80% excited and 20% scared. You’re such an amazingly empathetic and humble leader. I’m positive wherever you go success will follow. Let’s grab coffee/lunch/whatever next time you’re in town! Amazing. You never cease to be a hero. You are an inspiration to many more than you know. Here’s to many more days above the waterline. Congratulations. Yours is a true success story, one I’m thrilled to have seen develop over the years in person. Thanks so much for your work over the years, Cory. You saved me a lot of stress and made my workflow easier when creating work for my clients. All the best with the next chapter. I’m sure I’ll see you around online. Corey, so excited for you! Looking forward to seeing where all this leads you. It has been great working with you over the past year. I wish we could have worked closer during this time. Hopefully our paths will cross in the future and we will have another chance. I know you are going to kill it with your next adventure! Congrats. “Work Corey,” been a pleasure to work with you in the short time we got to …. excited that you and Lindsey are working closely together more now. You’re a power team! Thank you for the kind comments and encouragement! 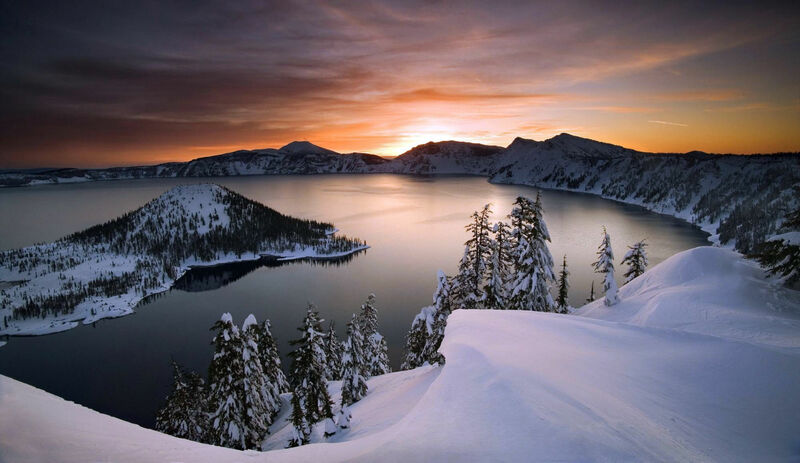 I love Crater Lake, bon voyage! Hehe, I read your every word. Congratulations and seriously bon voyage on this new adventure! Do big things, Mr. Miller. Wishing you all the best, my friend. Very grateful to you for leading the way for a lot of us in the community and doing it with your level of kindness, authenticity, and selflessness. Looking forward to following your next success story! Exciting news Cory, wishing you all best. No doubt it’s 20% scary, but challenging yourself is how you grow and I’ve got absolutely no doubts you’ll succeed in your new ventures. I look forward to reading about the journey! Wow – a bold move that I am sure was not easy to make. I am proud of you for being brave enough to do it! Congratulations – I am excited for you! Congratulations Cory! I wish the best for you and your family in this new chapter of your life. Thanks Von! Gosh I still remember this little punk kid emailing you and asking if the Master would do a logo for us. 11 years later I still love it! Congrats Cory! You have a large body of work to be proud of, and I can’t wait to see your next body of work unfold. Wish you the best Cory! Good luck with that, Cory! I think you’ll going to do an awesome job at it. I’ve been thoroughly inspired by your work in the WordPress community. I am sure your coaching gig is going to be helpful to many. Congratulations. Your journey and openness have been inspiring. Wishing you all the best for the next adventure. iThemes is one of the companies that I admire. You and the team have built great products for us. Thank you and wish you best in the next adventure! I would also encourage you to get the Kolbe certification training to help in your consulting. You are a living example of someone who embraces their conative traits and uses them to their fullest. Too many (me included at times) follow someone else’s “opinion” of how you should work and what you should do to be successful. The more people know ‘how’ and ‘why’ they work a certain way, the better they are at teaming with people who will do the things that are necessary, when our own conative makeup has us resist. Re-read your post with your Kolbe results page (https://e.kolbe.com/mymo/user/corymiller303/rid/2863B083-1627-4CE6-ACE6-6F4949247CF7) open and see how what you say, and even how you went about writing the post, fall right in line with your results. And no, I don’t work for Kolbe. But I believe it can help a person and build successful teams/companies. Hey Jerry, thank you! You’re right on with everything you’ve said … I’m a huge cheerleader of Kolbe as it’s made a difference in my life and business. And YES — I took the 3-day certification several years ago and even met Kathy Kolbe. She’s fantastic and so is her team.